The f00die Stove: Before – Jay Luker – Really? ... Wow. 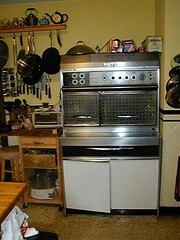 Our trusty <a href="http://easterkiwi.wordpress.com/tag/frigidaire-flair/">Frigidaire Flair</a>. It came with the house and was used from August, 2002 until the remodel in Fall, 2006. It&#8217;s a joy to look at and always prompted comments from visitors. Cooking with it was a mixed bag. The dual ovens were nice, but neither were large enough to cook more than a medium-sized broiler chicken, much less the Thanksgiving turkey. The slide out burners were also a cool feature, although the front-left one never worked and the front-right had the strange glitch of having only two settings: Off and Extremely High. Great for boiling water and for stir-fry.